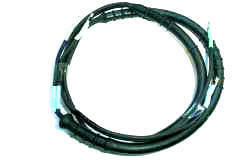 OEM 982563 for 400-800 Mechanical shift cable installation. When installing, it is recommended to remove battery. 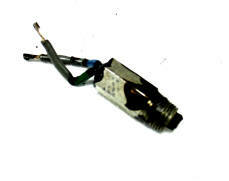 Failure to remove battery could possibly cause the wire to short from the wire rubbing on solenoids mounted on the engine or boat engine electrical components. 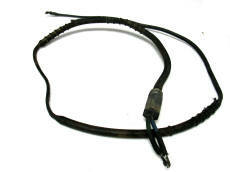 This is an original OEM part manufactured by BRP. This is compatible with 1982-1985 mechanical models. It will not work with the 1978-1981 servo hydraulic lower unit. To determine if you have the mechanical shift model years 1982 to 1985, check to see if you have one small anode in the lower unit. 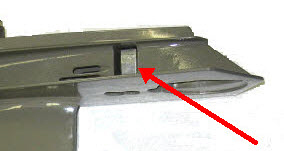 Indicated in drawing by the red arrow pointing to the anode. If your lower unit does not have this anode you have the 1978 to 1981 servo hydraulic model.Please note the newer years 1982 to 1986 cable has 2 rings on the end where it joints the shift converter housing. The older type will have one grove on the years 1979 to 1981 and no groves on the year 1978 unit. See our 800 series videos for more installation help. 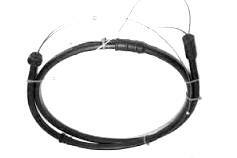 When installing, it is recommended the use of Johnson outboard gasket retaining compound to seal between support tube OEM-310644 and the wire.